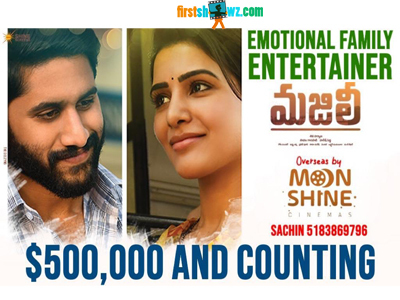 Naga Chaitanya, Samantha starrer Majili is turning out to be one of the biggest blockbusters in the former's career. The film which received good talk is having a great run in US, and it has grossed more than $500k already. Majili is also extremely doing well in both Telugu states both in multiplexes and single screens, that all the buyers will be in profit zone. This Shiva Nirvana directorial is likely to gross $1 million dollar mark at the box office in US, while it enjoyed a fabulous first weekend at the box-offices. Majili also featured Divyansha Kaushik in other lead role apart from Naga Chaitanya, Samantha. Vishnu Sarma handled the cinematography and Gopi Sundar composed the music. Thaman provided background score. The film is produced under Shine Screens banner.